It is early July. As I look through my front window, I can see what’s left of the spring blooms that only months ago covered our front yard. The tall dried stems of wildflowers cling stubbornly to the parched soil. Dotted here and there are orange California poppies, which are inexplicably thriving in the heat, and the long legs of a few tenacious pink clarkia rise from the sea of hay. I’m reminded of hikes in the Santa Monica Mountains, camping in the Sierras, and old postcards from the ’70s of a girl walking in a field, the sunlight glinting in her hair. A bit of old California has been growing in our yard. A little over two months ago, the flowers were at their peak and swaying in the breeze: bright yellow tidy tips, purple, pink, and white clarkia, and tiny cornflower-blue bird’s eye gilia. Bright sunlight reflected a rainbow of colors through our living room window like nature’s spin art. Bees and butterflies converged on the yard, eating hungrily from the blooms, and birds danced on the stems and rummaged in the dirt for bugs. 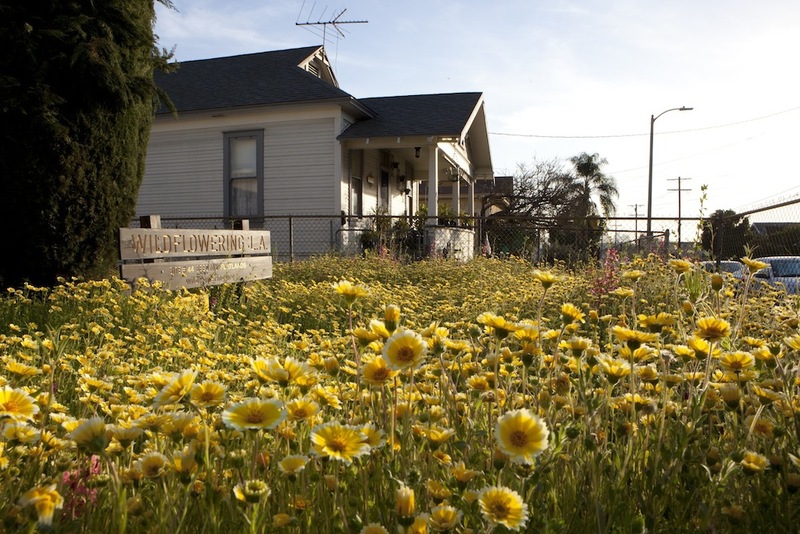 All of this happened in my yard because of Wildflowering L.A., a unique living work of art that grew in 50 yards across Los Angeles County this spring. 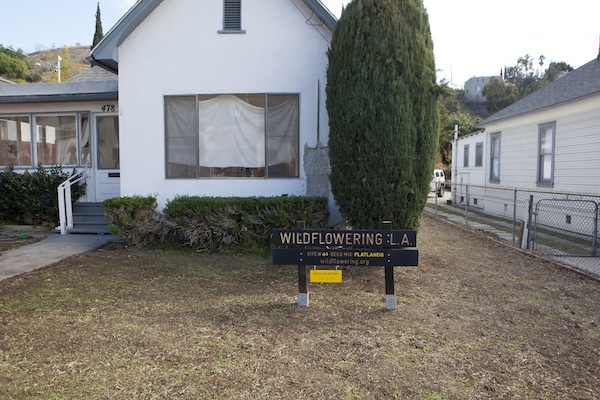 Wildflowering—a project encompassing art, nature, and community-building—was masterminded by artist Fritz Haeg, who worked with the Theodore Payne Native Plant Society and the nonprofit LAND (Los Angeles Nomadic Division). I learned about the project last fall when I happened to pass a stall at the Hollywood farmers market. A postcard caught my eye, and I stopped to find out more. I learned that anyone could participate as long as you had a yard that was visible from the street. My husband and I had just bought a house in Lincoln Heights that needed a lot of work. We’d planned on eventually taking out the 40-year-old thatched grass clinging stubbornly to the ground around our house; it just wasn’t at the top of our list. 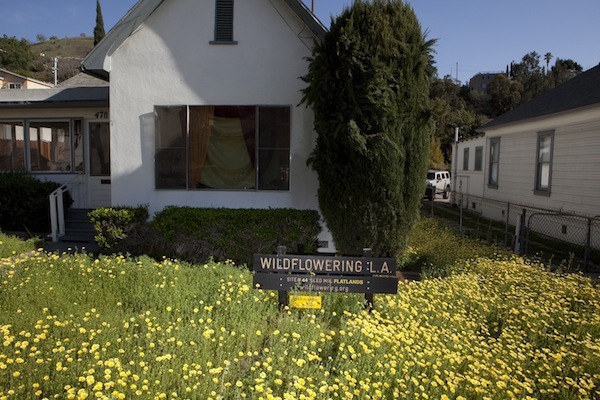 Wildflowering L.A. seemed like a perfect opportunity to expedite removal of the eyesore that was our front lawn. It would also allow us to take advantage of the LADWP turf removal program, in which L.A. County residents receive $3 per square foot to replace their lawns with drought-tolerant landscaping. So we submitted photos and a description of our yard, and a few weeks later, I received an e-mail welcoming us to the program. We attended a workshop where a group of folks from Theodore Payne handed out bags of seed mix and explained the planting technique (no fertilizer or mulch; spread the seed evenly but don’t dig in; water regularly until the plants are established). We received the Flatlands Mix based on the micro-climate and elevation of our yard. A landscaping consultant informed us that our lawn was kikuyu grass, which would be very difficult to remove. He was right, of course. Removing the grass involved renting a very large sod-cutting machine that didn’t even make a dent in the lawn. When that didn’t work, we had our contractors hire a few guys to dig it out with pickaxes over the better part of a hot November weekend. With the yard finally cleared, we sprinkled the seed, watered—and waited. 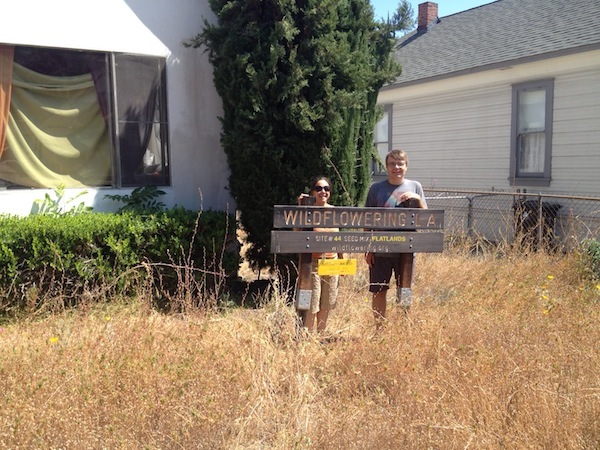 A team came by with a beautiful sign made especially for Wildflowering L.A. that included our site number (44) and the specialized seed mix we had planted. Our bare dirt yard with its sign resembling the kind you see in a National Park was a curious sight. Neighbors stopped to ask: Was the sign put there by the city? What would we be growing? Why did we take out the lawn? Some people seemed a bit disappointed that we had removed a perfectly good lawn, so carefully tended for many years by the house’s well-loved previous owners. But they brightened when we explained what would be growing in its place. It felt great to engage with people face to face, and to have a reason to meet and talk to our new neighbors. And over the course of the dry winter, as dirt gave way to a lush meadow, our yard became a destination. On many occasions, we looked out the window to see kids looking at our yard and the description of the flowers in our seed mix, which we had laminated and hung on our fence. Neighbors who were previously skeptical waved and nodded their approval. In fact, whenever people stopped at our gate, we invited them in. It was lovely to see the smiles on their faces and their reactions both to our hospitality and to the abundant flora and fauna. Mornings brought our own personal nature show, viewed with coffee cup in hand through the large picture window. In the late afternoons, golden sunsets set the yard aglow. As the flowers began to grow, colorful birds flocked to the yard, perching on the fence and stems, rolling in the dirt, and feasting on the plentiful insects that found an enticing habitat among the nascent plant life. Multitudes of bees and butterflies happily drank nectar from the upturned yellow tidy tips. Photographers came by to capture this unique site, and we were even visited by a group from nonprofit organization De Lab (Design East of La Brea), who came by to experience the flowers at their peak and learn about the project. In April, there was a culminating Wildflowering event in which all the project participants brought cuttings from their sites and placed them on a giant map created with masking tape. It was interesting to compare our experience with those of others—we bonded over what grew and what didn’t, and over how much weeding and watering we had to do. Many of us came away with a feeling of camaraderie in having been part of this experiment. A few weeks ago, a guy from Wildflowering LA came to take away the sign; we had him take one last picture of us with it in our scraggly and faun-colored yard. We were sad to see it go. The few flowers that are still blooming miraculously from the scorched earth are proof that native plants can hold their own in this dry climate. Now that there is a seed bank dormant in the soil of our yard, many flowers will return next spring as long as there’s a bit of winter rain. In the meantime, to augment the wildflowers, we’re planning a perennial California native garden that will include salvia, buckwheat, and possibly even an oak tree. Perhaps then we’ll have done our part to revive a bit of Old California in our neighborhood. Jennifer Mandel is a California native who was born and raised in the greater Los Angeles area. She is a music supervisor by trade, a singer-songwriter, and a lover of all things wild. The Connecting Los Angeles series is supported by a grant from the California Community Foundation. Primary Editor: Becca MacLaren. Secondary Editor: Sarah Rothbard. *Lead photo and interior photos by Isabel Avila. Final photo courtesy of Jennifer Mandel and Timothy Wager.